Stamp your mark anywhere on anything! With these compact, portable easy-to-use Numbering and Lettering Kits. 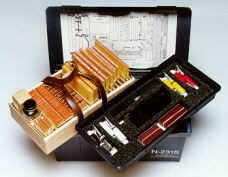 The N-2315 and N-2315A (includes the 5/64" (1.9mm) peg stamp set) contain everything needed for permanent marking, numbering or lettering on switchboard panels, ternimal boxes, sub-assemblies, chassis etc. It's ideal for marking wire, cables or wherever permanent, easy to read marking is required. Painstakingly hand crafted in the United States from the finest materials available. For production marking or for those who need a faster drying time we recommend drying accelerator (N-2884) which mixes easily on the job site. All components fit securely in a light-weight, compact carrying case so you are always prepared for any alphanumeric marking application. A complete list of all replacement parts and supplies is readily available on request. High impact plastic carrying case: 16 5/8" (42.1cm) (L) x 9" (22.9cm) (W) x 9" (22.9cm) (D). Peg stamps: 3/4" (19mm)= N-1382, 3/8" (9.5mm)= N-1721, 1/4" (6mm)= N-2706, 3/16" (5mm)= N-1378, 1/8" (3.2mm)= N-1379, and 5/64" (1.9mm)= N-1564. Stamp repair set: Adhesive backed letters, numbers and symbols in the following sizes: 3/8" (9.5mm), 1/4" (6mm), 3/16" (5mm), 1/8" (3.2mm)= N-2567. Repair with 5/64" (1.9mm)= N-2567A. Fuse capacity stamps: 3/8" (9.5mm) and 3/16" (5mm)= N-2467. Stamping ink (two of each per kit): Black= N-2880, White= N-2881, Yellow= N-2882, Vermillion (red)= N-2883. Additional components: Spreading knife= N-1060, Marking remover= N-2121, Brushes (4)= N-2119, Inking plate= N-1373, Bottle w/ dauber= N-1982.